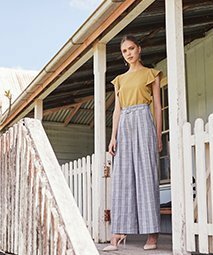 Curate chic silhouettes with all day comfort and versatility in wide-legged, high-waisted culottes. Ideal for this summer’s wardrobe, style it with basics or our sleeveless tops to flaunt the culotte’s natural flare. The desk-to-dinner transition is effortless with culottes, dressed up or down with a pair of heels and statement necklace.